Today i had the pleasure of fishing with 2 of my favorites client, Bill and Terry. 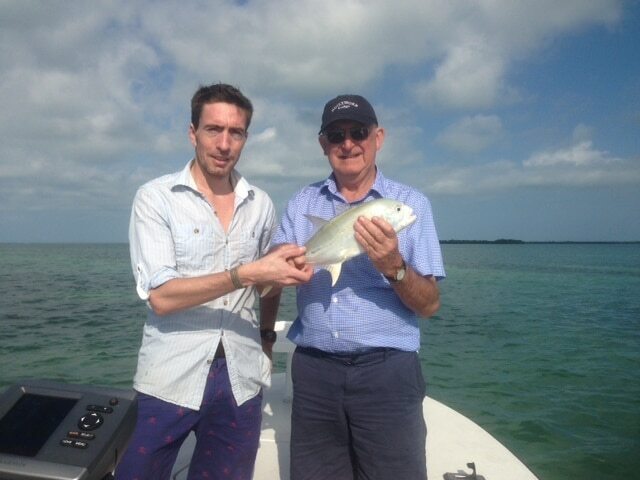 We went out today in search of bonefish and permit. 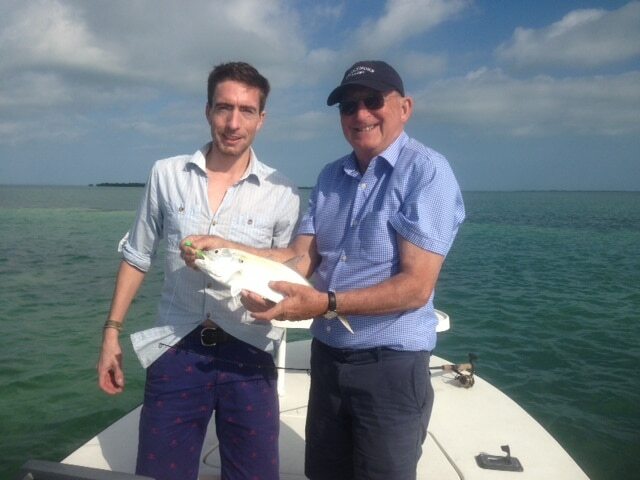 I headed to a flat east of Key west that has been good for bonefish. I spotted my first school of bonefish after about 15 minutes. Bill did not hook up on the first few schools but once I changed from a crab to a jig, he hooked up right away. We finished this flat and went in search of permit. I only found 1 before we headed home. Posted by Capt. Anthony Skinner, on February 19th, 2014 at 8:47 pm. 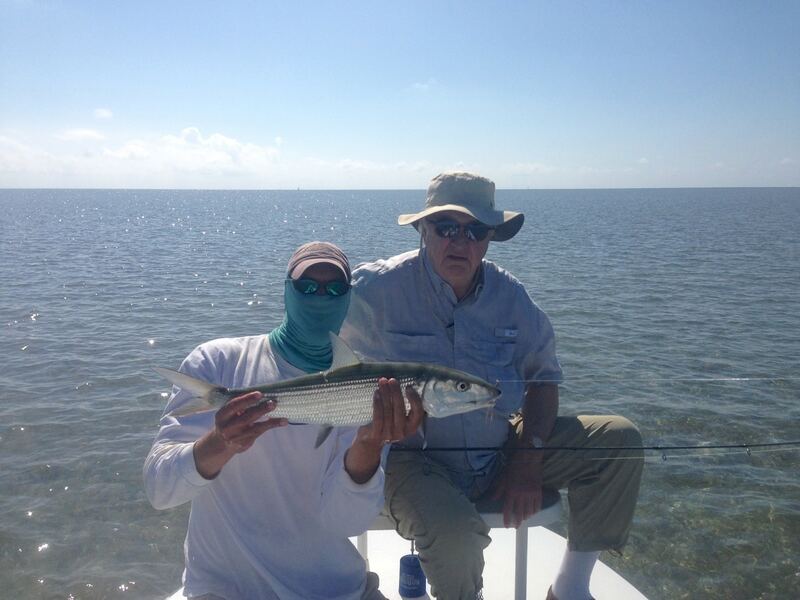 Yesterday I fished with Capt Mike Bartlett. We started out fishing for tarpon and found some rolling but we did not get a bite. 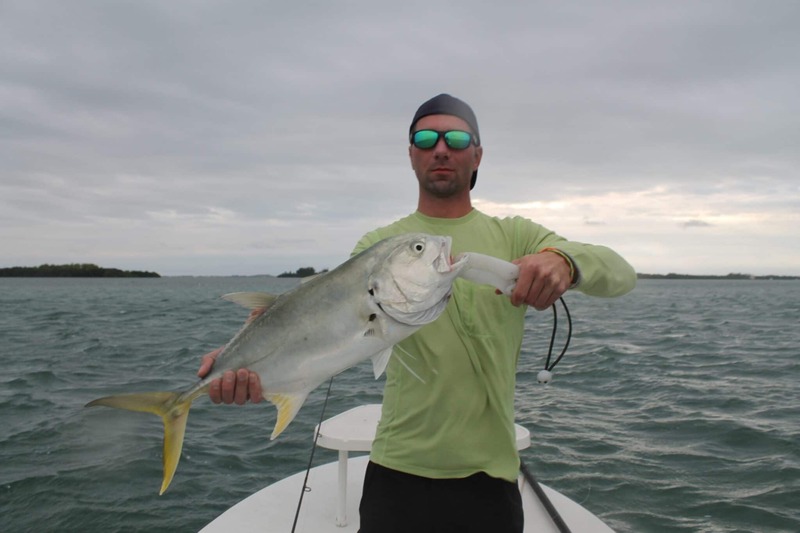 We went west of Key west in search of the elusive permit. 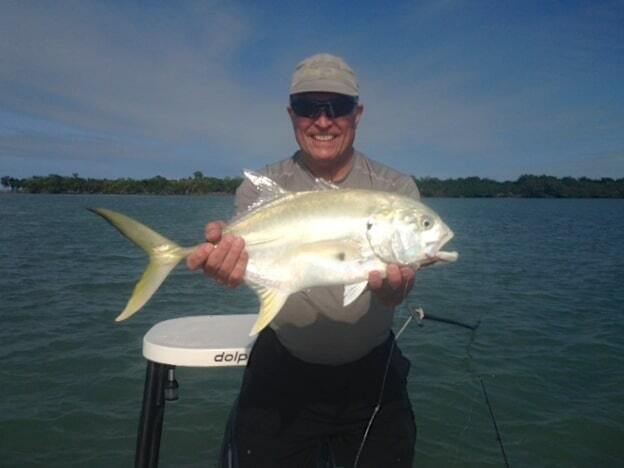 We caught the beginning of the incoming tide and found a good number of permit, he caught this nice permit on fly. Today I fished with Sue and Dale. We set out of Key west at 7am in search of tarpon. 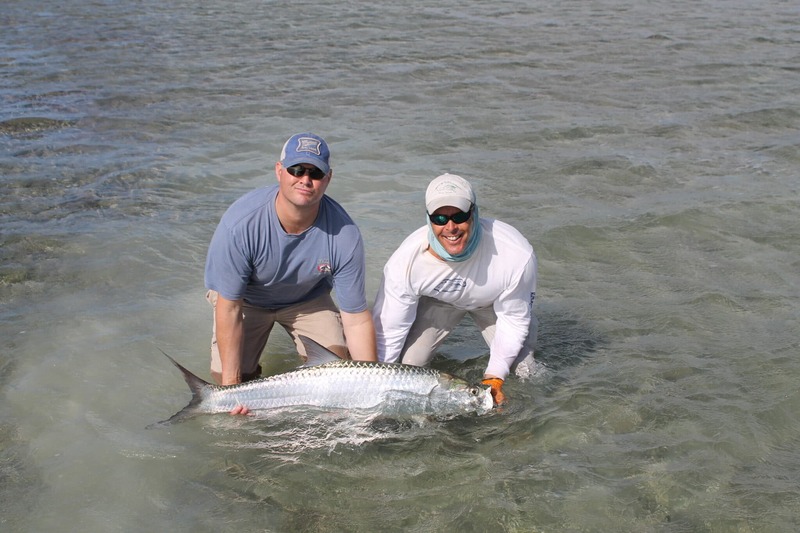 Our first drift Dale hooked and landed a 60-80 pound tarpon. We tried another spot that had a few rolling fish but all we hooked were a few nice jacks. Off to the flats to do some permit and barracuda fishing. 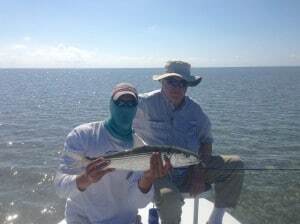 Dale once again hooked and land a nice barracuda off of our first and second flat. Our third flat was a bust so we headed home. My second half was with Terry Hamby. 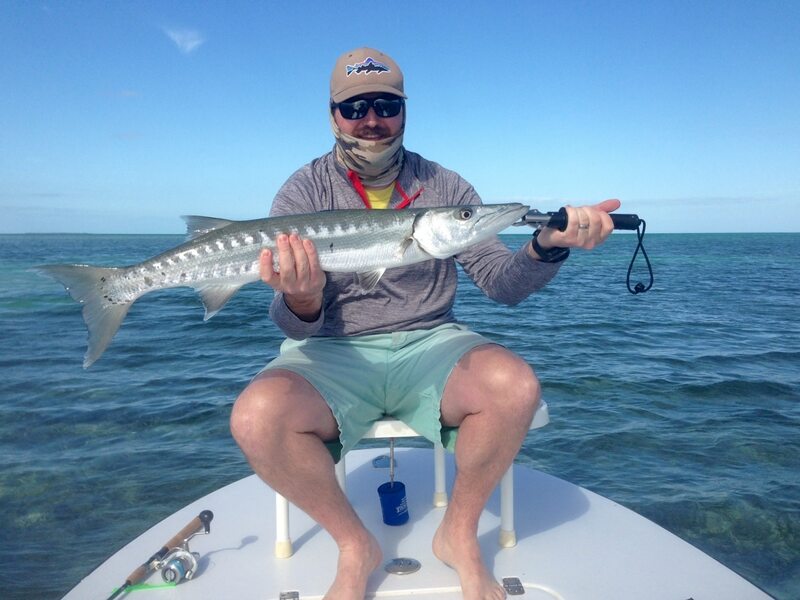 We hit a few spot east of Key west and landed a few barracudas and jacks. We went in search of permit and had a few shot but we did not hook up. We did see several nice sharks and a few dolphin. Posted by Capt. Anthony Skinner, on February 5th, 2014 at 9:22 pm. 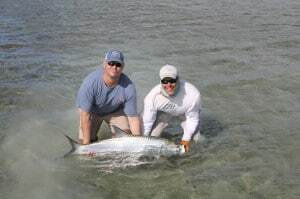 This past weekend I fished with Tom Schrade for the cuda bowl. We started out great, our 2nd cast we landed a 45 inch cuda. We jumped off 2 fish before we we came solid on a truly huge fish that wrapped around a crab trap and came off. We headed east of Key west and ran into a slow patch. the tide topped out and we landed a 45, 40, and multiple smaller fish. Posted by Capt. Anthony Skinner, on February 3rd, 2014 at 4:40 pm. On another clear, windy and cold day in Key west. 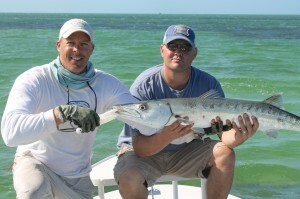 My anglers Harry and Sandy both landed nice barracudas and Harry landed a 40 pound lemon shark. The day started with Sandy landing 2 cudas on the first and the second flat we fished. Harry landed his cuda on the second and his shark on the 3rd flat. Posted by Capt. Anthony Skinner, on January 24th, 2014 at 7:40 pm. 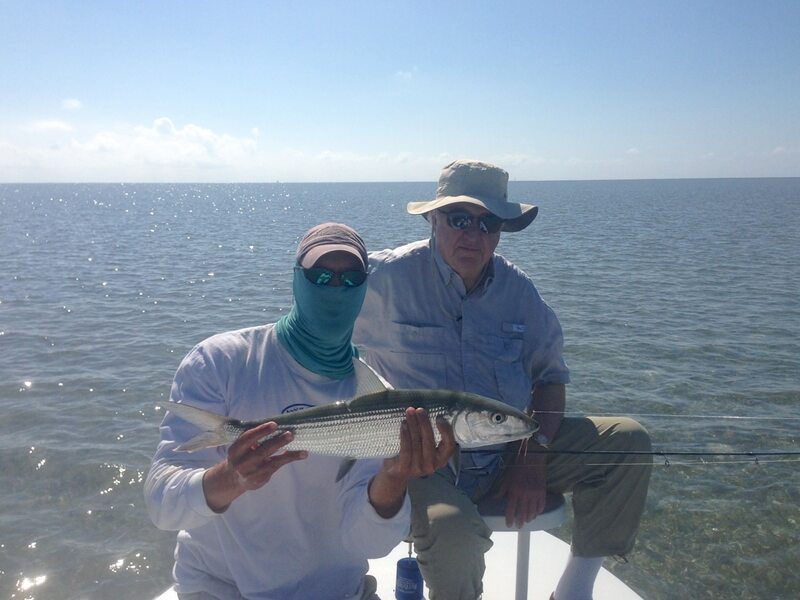 On a very cold day in Key west I had the pleasure of fishing with Bruce and Steve. We headed out at 1pm looking for the beginning of the falling tide. We had our first strike at our first flat and landed a barracuda on the next. We had a few strikes that we missed before the tide was right for shark fishing. We chummed up plenty of sharks and almost got spooled on the first shark before I locked the drag down and broke off. Our second shark bruce landed, it was a very respectable 5ft lemon. Posted by Capt. Anthony Skinner, on January 23rd, 2014 at 9:18 pm. What a beautiful day to go flats fishing, clear skies and light winds. I fished with Brad McCaslin from Maryland. 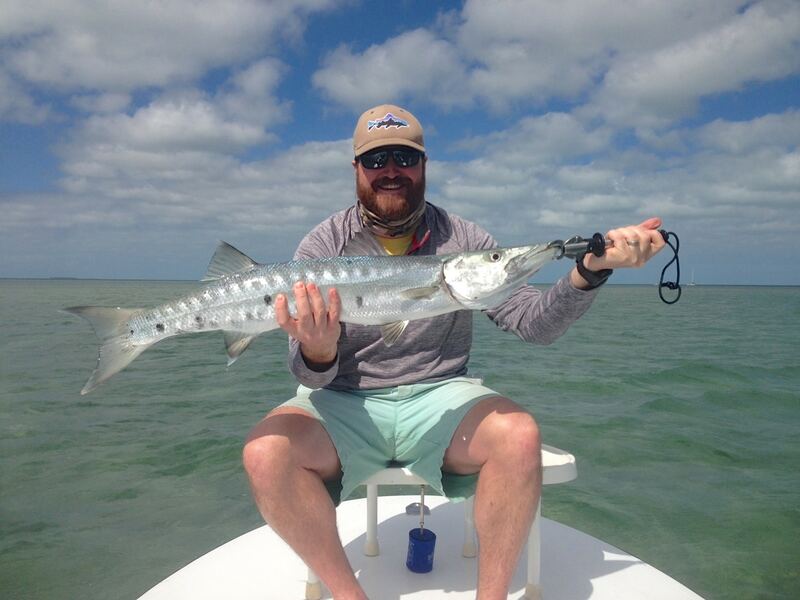 I fished the Atlantic side of Key west for Barracuda and sharks. The cuda fishing was excellent today and we found fish on both flats we fished. 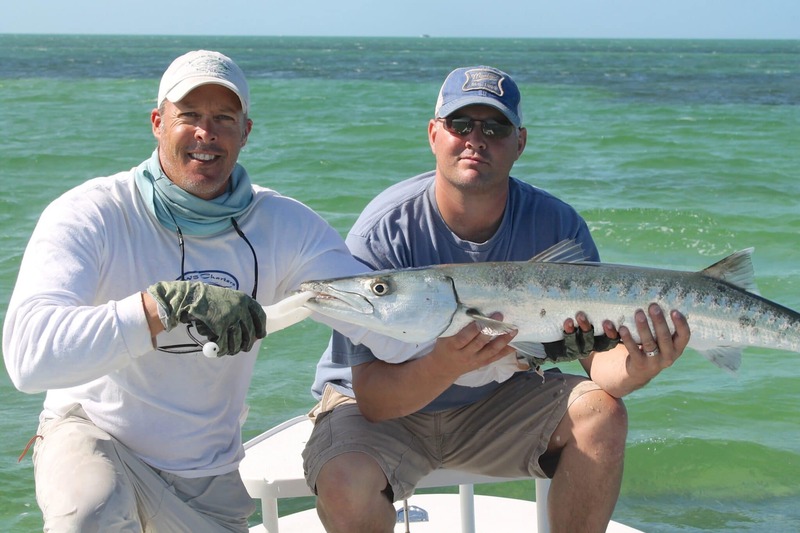 We landed 5 barracudas on the first spot. 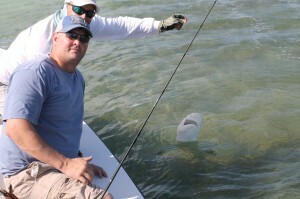 Our second spot we had a few grabs but only landed 1 lemon shark. Posted by Capt. Anthony Skinner, on January 19th, 2014 at 7:53 pm. Today I had my first double of the new year. My first trip was with a long time client Al Mcaughlin and his son Roy. 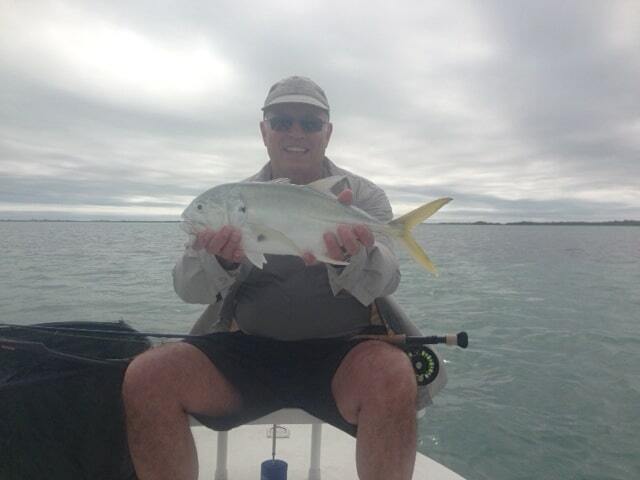 Al prefers action over size so we went east of Key west in search of jacks. I ran to a little cut that has been working well on the incoming tide and we had action right away. Roy started by catching a few nice snappers before we got into the jacks. 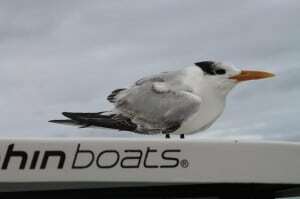 I posted up the boat and for about 30 minutes it was non stop action. We hit 2 more spots that did not work before we headed home. My next trip was with a fly fisherman by the name of Mike Miller. We hit the flats in search of permit and jacks. We saw a permit right away but that would be our last of the day. The clouds started to form so our only chance were jacks on the backs of sting ray’s. Mike missed a few fish before he hooked up and landed a nice jack. The skies darkened to the point that we could not see the muds very well so as hard as we tried we did not hook up again. Posted by Capt. Anthony Skinner, on January 14th, 2014 at 12:50 pm. Tarpon were the species of choice today for my clients Mike and John today. 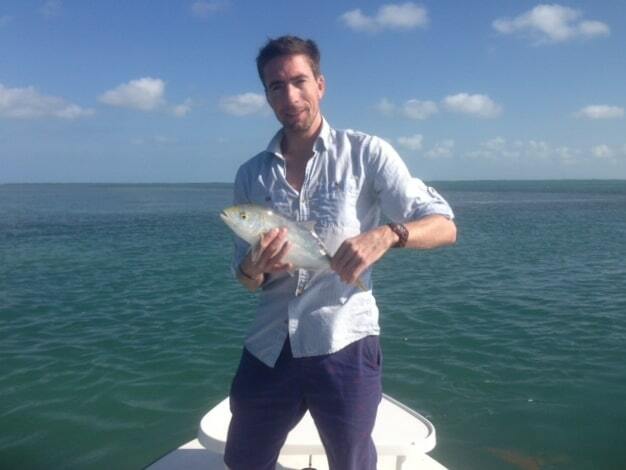 We headed out of Key west at 7am and started fishing with pin fish in a channel a few miles away. 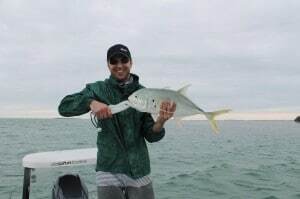 we had a few bites but they were jacks and sharks so we headed to another spot further away. 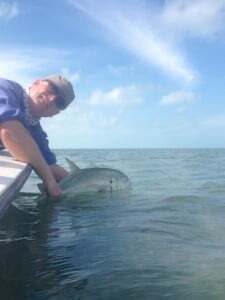 We landed a few more jacks before we hooked up on a huge tarpon, this fish jumped 3 times before it headed down the channel for deeper water. I dropped anchor to follow but we lost the fish on the last jump. We got up on the flats to fish barracudas and permit but we landed a few more jack before we had to head in. Posted by Capt. Anthony Skinner, on December 16th, 2013 at 8:36 pm. Posted by Capt. Anthony Skinner, on December 14th, 2013 at 6:00 pm. 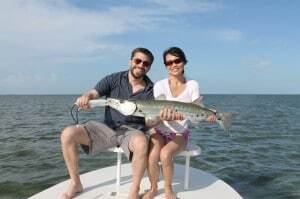 I spent a lovely 4hrs with Frank and Sharon fishing for tarpon, permit, sharks and barracudas. We caught 3 out of 4. Sharon hooked up first on a tarpon around 80 pounds, we got a few jumps out of the fish before he jumped and spit the hook. Fred hooked up next, this tarpon was smaller but what he lacked in size he gained in tenacity, this fish went around the boat numerous time before we landed it for the picture. We headed North of Key west to a flat in search of the remaining 3. Fred hooked and landed a lemon shark after a few tries. 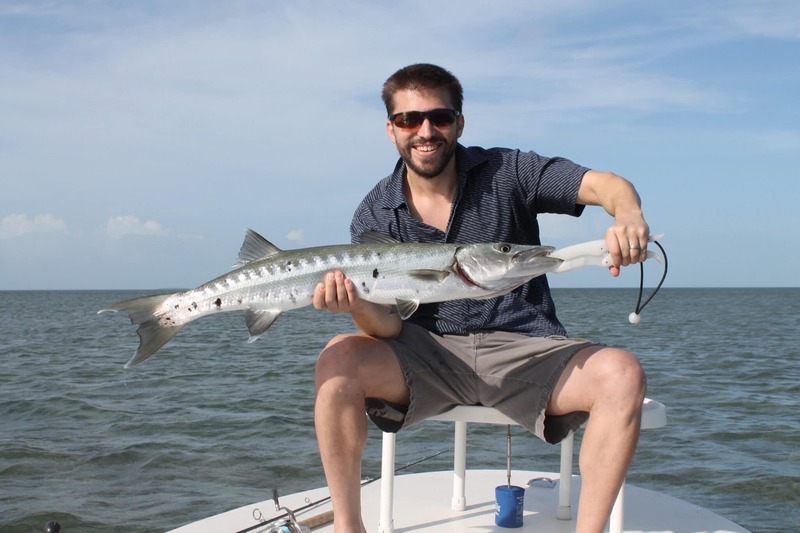 The barracuda took a little more time but we landed a nice one before we headed home. Posted by Capt. Anthony Skinner, on December 9th, 2013 at 6:18 pm.